After setting its pre-order page, Globe has unveiled their postpaid plan for the Galaxy Note3 and the Galaxy Gear. The telco dubbed this team-up as the “unbeatable and affordable unlimited data plan offer for the Samsung Galaxy Note 3 in the market today.” As usual, you could get free unlimited LTE connectivity with speed up to 42 Mbps. For as low as P1799 monthly, subscribers can already avail of the latest Galaxy Note at Plan 999 with a monthly cashout of P800* over a 24-month contract period. The postpaid plan offer already comes with unlimited data that allows subscribers enjoy the powerful features of the Galaxy Note 3, including a monthly consumable amount for calls and texts. 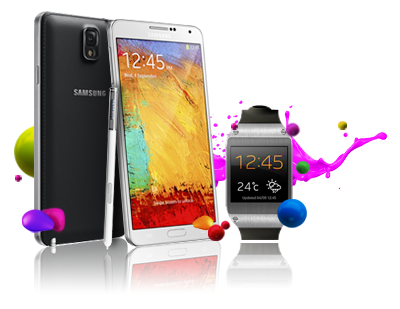 In addition to the aggressive pricing for the Samsung Galaxy Note 3, Globe is also offering the Samsung Galaxy Note 3 and Galaxy Gear bundle for free starting at Plan 5000 over a 24-month contract period. The Samsung Galaxy Note 3 has a 5.7-inch full HD Super AMOLED display, a 2.3 GHz Quad-Core Processor, Android 4.3 Jelly Bean, 13-megapixel rear auto-focus camera with flash and zero shutter lag and a 2-megapixel front camera, 32GB user memory and is a 4G LTE-capable device. Additional features include the Air Command, Action Memo, Scrapbook, Screen Write, S Finder, Pen Window, Direct Pen Input, New Easy Clip, New S Note, Samsung WatchON and ChatON, and S Voice. Meanwhile, Samsung Galaxy Gear boasts of an 800 MHz single core processor, has a 1.63-inch Super AMOLED display, and 1.9 megapixel auto-focus camera. Additional features include the S Voice, Memographer, Smart Relay, and Voice Memo. It also has a 4GB user memory plus a 512MB RAM. Aside from these innovative and value-for-money offers, all new and re-contracting postpaid subscribers are entitled to a free one-month subscription of Globe Gadget Care, the first-ever mobile phone protection program in the country today that offers comprehensive coverage for mobile phone theft and accidental damage, guarantees hassle-free handset replacement, easy claims processing, and worldwide protection coverage. On the back of these competitive offers is a strategic partnership that Globe recently forged with Samsung as part of the SingTel Group focused on driving next-generation mobile communication, infotainment and technology services in Asia. The new collaboration takes advantage of the scale of the SingTel Group and Samsung’s innovative products and services. Under this partnership, both parties will offer applications and digital services to customers of SingTel Group companies. In addition, the SingTel Group will work with Samsung to identify opportunities for joint launches and marketing campaigns of key Samsung device announcements. The companies will also be able to leverage each others’ distribution channels to extend their retail reach to more customers. Interested? Your Samsung Galaxy Note 3 here.